Starring: Nivin Pauly, Anupama Parameshwaran, Sai Pallavi, Madonna Sebastian, Krishna Shankar, Sabareesh Varma etc. Hello everyone! Remember me? I’ve been back since very late Friday bit after 20 + hour watching movies, I was still pretty exhausted that I didn’t even have any energy to blog right away. Hope everyone’s doing well whilst I was off the blog-osphere. Well I was practically off line entirely as I barely got time to even check replies on social media in the past weekend. It’s been a slow weekend for me in terms of movie watching but a hectic one otherwise. Well, that was that, & summer is unofficially over. Yes I know the weather is still going to be pretty warm for most of us, but once we enter June, you would say that Monsoon is in the air. And there’s something about the monsoons that fill the air with romance. The path to your heart opens fuller, heightening your ability to cherish beautiful and romantic things. Watching Premam (Malayalam) kinda movie this Monsoon is a beautiful feeling as cool as ice pop on hot day and yet as warm as love. 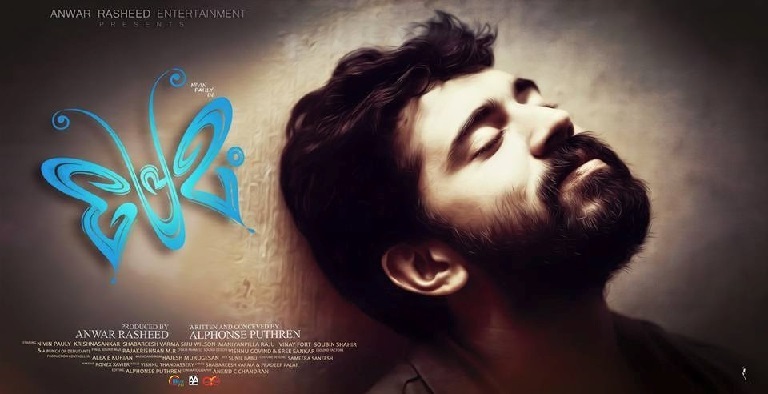 Premam portrays the journey of George David (Nivin Pauly) from his school days to his engagement day. It’s also tells how three girls (seasons) influence him in different stages of life. On watching this movie one can easily realize that… “World is a stage and life is a drama with lot of characters and twists-turns in it where each and every small person plays a vital role in bringing in the ultimate changes in one’s life.” Each and every one’s life in this world has a unique story like that of Premam and while watching this movie you will definitely turn back pages in your life and recall the past memories and there lies the success of this movie. Each and every frame in the movie speaks about the effort taken by Alphonse Puthren to make it a celluloid poem. First (Mary means Autumn) Story: Happy go lucky guy George David in his pre-degree days and his first crush with Mary George (Anupama Parameswaran) and their separation. Second (Malar means Rainy season) Story: George David’s golden era during which he sets out of his past separation and meets his college professor Malar (Sai Pallavi) and fall in love with her. Third (Celine means Christmas time) Story: After completing his studies and after an unfortunate incident. Now he has third love with Celine (Madonna) with some confused emotions. Will he get married in the end or not forms the rest of the story-line. Alphonse Puthren, who made promising debut with critically acclaimed with Neram, is in his top form and add interesting incidents to move the story forward. The plot and script are completely different from his earlier film. Though a three layered love story through the life of a person is nothing new to cinema (we have seen in Cheran’s Autograph & Mera Naam Joker), but the scenes are well placed to make the flow continuous and different. The movie totally belongs to the director Alponse Puthren. He proves his skills in interweaving a neat screenplay for a sensible subject like this. First half of the film is packed with lot of gleeful moments happening in George’s teenage life. Second half lightens our hearts and prepares for some twists and turns. The plot could have been developed better by including more elements like making George more resolute – by allowing more time for the love relationship to mature before it fell apart. Elements like these add more uncertainty to the film. The dialogues are sharp and natural at all the places. The way director utilized score of Rajesh Murugesan deserves a special mention. The tunes in background and songs are tailored for the storyline. Especially the fusion of Guitar-Violin, Drums-Flute and the beats in the engineering life are simply magical. “Malare” song is beautifully shot and “Rockaankuthu” (choreographed by actress Sai Pallavi) & “Scene Contra” are brilliantly choreographed tracks. Hats off to Rajesh and I expect more of such work from him in the future. Lyrics by Shabareesh Verma are refreshing. Cinematography by Anend C Chandran bring out the colorful vibrancies of Kerala and constricting dull hues of Kodaikanal, which makes an ideal ambience for a light hearted entertainer. Editing by director Alphonse Puthren is fine. The scene styling patterns and cuts deserves a special mention. Shorten the screenplay by 10-15 minutes and you have a much powerful story. Production Values of “Anwar Rasheed Entertainments” are apt. Nivin Pauly is effortlessly charming and lights up the screen with his presence, sharing amazing on screen chemistry with Sai Pallavi, Madonna & Anupama. He is like a magnet pulling you into George David’s world and making you believe in one sided love story. You are silently rooting for him every time his love is let down, trampled upon and rejected outright. And his massy attitude in the college life is brilliantly shot. Sai Pallavi (Telugu Folks have seen her in Dhee Season 4 (Click Here), I must say, she wouldn’t have asked a debut better than this one. She delivers a range of emotions effortlessly, while looking beautiful in every scene. She is impressive in “Rockaankuthu” song training. Anupama Parameswaran has acted well and her eyes are expressive. She has got a lot of close up shots and her face and eyes emulates all her emotions. Madonna Sebastian was lovable with her realistic performance and cute looks. Vinay Fort and Shaubin do a fine job and evoke laughter in regular intervals. Cameos by Alphonse Puthren, Renji Panicker and Jude Anthony are effective. 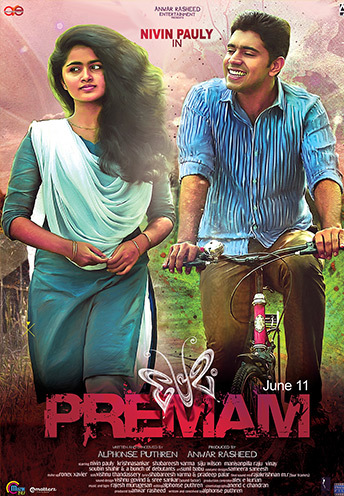 Premam is a director’s film. The screenplay is taut, there is very little ruffle to swing away from the plot for the occasional corny line, and several feel good narrative sequences at turning points of the film. On the whole, if you watch movies for time pass and expect an item number, forced comedy & commercial entertainment, it’s not your cuppa. It’s not for those who see movies, it for those who feel movies. 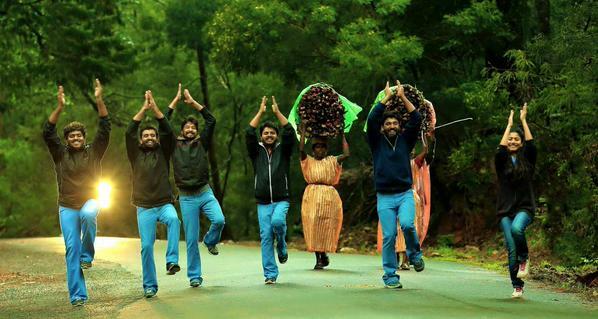 Premam is a bright and refreshing start to the monsoons. Cloud 9 Moment To See You Rating 3.5 ! !